I absolutely adore this Allen Roth Sable Mitchell bath vanity with farmhouse sink, isn't it gorgeous! This Allen Roth Sable Mitchell vanity is available at Lowes home improvement store to buy and you can actually find a really nice selection there of modern as well as contemporary bathroom furniture, one nicer than the next. However there is one brand within that selection that always stands out and that's Allen Roth. And no kidding, this Sable Mitchell vanity certainly explains why. 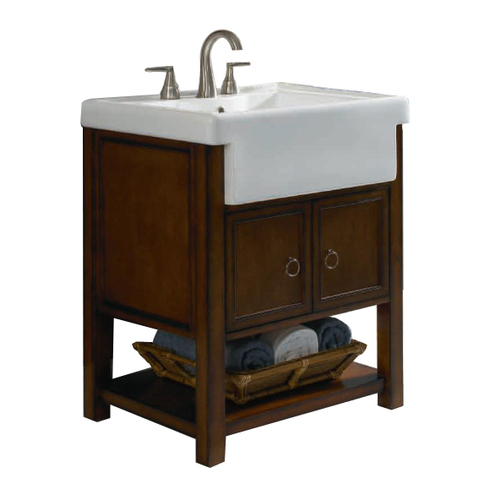 This Allen Roth farmhouse sink vanity set is interesting for sure. I love the rich wood in the vanity and the gorgeous hardware to go with it. I also really like how the farmhouse sink looks here, it really becomes an intregal part of the whole vanity, it's not separate from it in any way. In the picture they have put a tray with rolled up towels and the underneath shelf, and doesn't that provoke such as obvious spa-like feel! I think in the right space, this Allen Roth Sable Mitchell vanity would be absolutely gorgeous and just make the space! 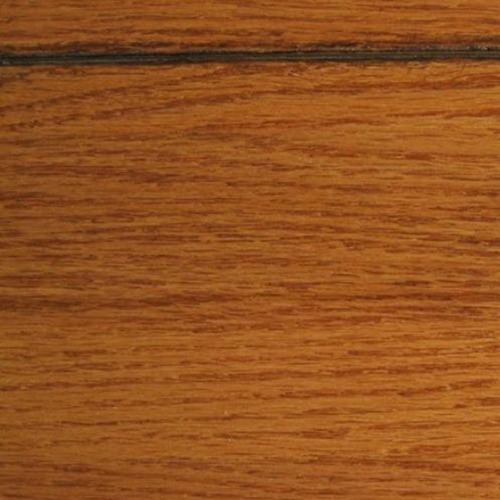 Fits Where: Perfect in most smaller scale bathrooms. Indoor / Outdoor Conclusion: What a nice design. That farmhouse sink in combination with that warm wood and the hardware, just makes for perfection, don't you think! "Brushed nickel hardware. Porcelain top. 2 doors with soft closing hinges. Fully assembled"
Get a nice breeze going on your patio or porch with this Allen Roth rubbed bronze outdoor ceiling fan from Lowes. Most people get fans for indoor use, and it's a great way to cool off your home without having to put on the AC (or in addition to the AC!) however what about the outside? What about those hot, stiffiling days when you don't really want to even be outside because the air just doesn't move. 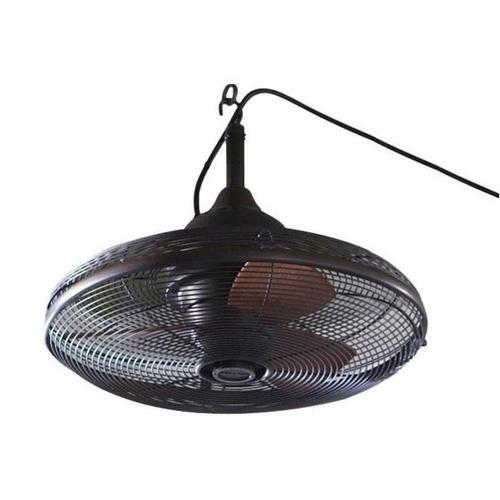 Well, wouldn't it be perfect to install one of these Allen Roth outdoor fans right on your porch or patio! That way you would have an outdoor spot that you can make relatively comfortable to spend time on, even when the temperature is climbing. I also think that this outdoor ceiling fan in rubber bronze is rather decorative and would be a perfect choice if you're looking for something functional, yet attractive at the same time. Indoor / Outdoor Conclusion: What a great idea! This fan looks classic and sleek, and I bet it works really great too. "Three ABS blades. 3-position knob control"
Add a rustic look to your house with this stone veneer European cobblestone masonry siding (available to buy at Menards among other places.) If you are in the process of building your house and you're debating what kind of facade you would like, or if you're remodeling your current house and feel as if it needs to be upgraded, then going with a part of full stone facade can really be a good idea. Some people choose to go with masonry siding at the bottom part of the house, and others might choose to do one wall, or part of the wall. No matter how you do it, this stone accent would definitely add a lot of charm. Because that's really what you get with stone masonry siding. You get a sense of authenticity which is hard to create in any other way. At Menards home improvement store you really have a lot of options to choose between - there isn't just one type of masonry siding, there is a whole bunch, so it shouldn't be too difficult to find something that works perfectly for you and your house. Stone Veneer - Bristol Canyon Stone - European Cobblestone-10 Sq. Ft.
"European Cobblestone is the natural choice for indoor/outdoor decorative application at a fraction of the cost and weight of natural stone. 1-3" thick stones vary in size with no repeats per 100 sq ft. Bristol Canyon Stone veneers come in multiple colors and styles to match and complement any home or building's current siding. Colors do not fade and are noncombustible. Complete your stone veneer project with Bristol Canyon Stone accessories: Chateau molding, keystones, window sills, trim stones, and capstones that add finishing touches to your stone project." "Stone Master manufactured stone veneer. For interior and exterior use. 10.76 square feet. Grey. Affordable. Lightweight. Easy to Install. Durable." This Heirloom slate high outdoor dining set comes complete with one round slate tiled table and six bar height chairs which fit perfectly with the table and offers a rather nice decorative design which would provide a really nice addition to any outdoor space. These Heirloom outdoor furniture are also available in other pieces, so if you're looking for a matching coffee table, bench, gazebo or other pieces, then you could get some really nice matching furniture. Indoor / Outdoor Conclusion: I really like the way this Heirloom outdoor dining set looks, I bet it would be really nice in almost any outdoor setting! Heirloom Slate High Dining Set - 7 pc. "The Heirloom Slate Dining Set offers a unique styled design and stunning addition to your patio, deck, sunroom or any outdoor/indoor dining experience. This beautifully styled dining set is a stunning addition to any patio, deck, sunroom or any outdoor/indoor dining experience. The superb craftsmanship of the hand-laid natural slate tiles and grouted with industrial ahesives creates a pleasing sense of continuity. Also available are the following items that will complement the Heirloom 7 pc. Slate Dining Set: Heirloom 3 pc. Accent Tables, Heirloom Bench, Royal Hardtop Gazebo, Somerset Pavilion. " Make your patio or porch, not only good looking but also very comfortable to spend time in with this Wilson & Fisher Easton patio dining set or this Wilson & Fisher Soho rocker chair chat set. All of these Wilson & Fisher outdoor furniture are from Big Lots, and I must say that's quite a good store to visit. Especially if you're on a tight budget, and you don't have a huge amount of money to spend, but you still want nice looking outdoor furniture, well then you couldn't go wrong. The Wilson & Fisher Easton spring rocker dining set features cushioned rocker chairs and a table. In this set which costs $350, you get a low tile top table, and four very comfortable chairs which you just want to hang out in, even just by looking at them! The Wilson & Fisher Soho patio set is more appropriate for dining and here you get five chairs and a glass top table. Of course, over at Big Lots there are even more options to choose between, so it doesn't matter whether you want someting more modern and contemporary, or if you prefer something that's more traditional and timeless, you have a ton of options and they're all great looking and affordable. Indoor / Outdoor Conclusion: Love the styles, the sets and the prices! "Set includes table and five chairs. Glass Dining Table: Marble pattern painted, tempered glass top with 18" Lazy Susan. Powder-coated steel frame. Assembly required (instructions included). Padded Rockers: Padded sling fabric is weather-resistant and dries quickly. Sturdy steel frame with weather-resistant, powder-coated finish"
"Includes table and four cushioned spring rockers. Tile Top Chat Table: Tile top table is a lower height to coordinate with casual seating. Durable, powder-coated steel frame. Assembly required (instructions included) Cushioned Spring Rockers: Includes weather-resistant chair cushions"
Sophisticated and elegant, there is not question about it, this Wilson & Fisher Savannah patio dining set as well as this Wilson & Fisher Savannah cushioned seating set, both of them made in all weather wicker, and available to buy at Big Lots, would be absolutely perfect for almost any setting. If you've been thinking of investing in some really nice looking outdoor furniture that not only were practical, but that also were supremely comfortable to sit in, then I think these pieces might be something for you. Featuring frames made out of handwoven all weather wicker, these furniture should hold up beautifully to the weathers, no matter whether you're living in an area that frequently hits rain during the summer. Traditional wicker was very sensitive to moisture and mold could become an issue real soon, however with these new resin all weather wicker furniture you get the great looks, but none of the problems so that's really nice. Over at Big Lots you have a lot of great looking Wilson & Fisher patio furniture, however this Savannah series is the only one in wicker that exude that comfortable old world charm, so if you want something for your patio or porch that just makes you want to sit down and sip lemonade, then these furniture would be for you. Indoor / Outdoor Conclusion: These furniture feature such great style, it's hard not to fall for them! "Set includes sofa, two chairs and ottoman. Cushioned Sofa: Natural handwoven all-weather resin wicker. 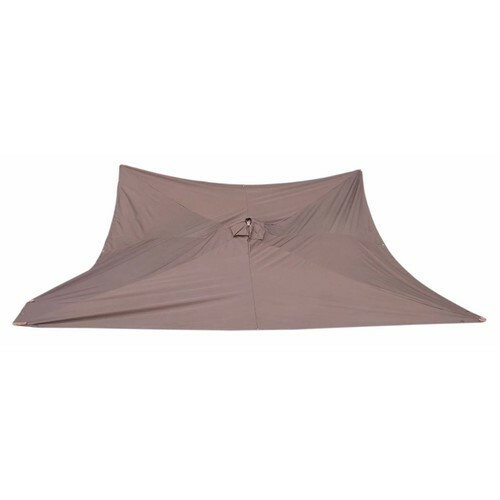 Includes weather-resistant cushions. Powder-coated steel frame. For indoor/outdoor use. No assembly required"
"Set includes dining table and four cushioned dining chairs. Square Dining Table: Natural handwoven all-weather resin wicker. Tempered glass, water-wave design table top. Powder-coated steel frame. For indoor/outdoor use. Assembly required (instructions included) Cushioned Dining Chairs: Natural handwoven all-weather resin wicker. Includes weather-resistant cushion"
Wouldn't this Village Green walk in greenhouse which you can buy over at Big Lots, be absolutely perfect if you wanted something affordable and practical that really would allow you to get serious about gardening? This Village Green greenhouse is priced at only $69 which is an absolute bargain. That truly means that you don't have to have a huge budget in order to invest in a greenhouse for your backyard, like many people believe. Of course, this walk in greenhouse is rather rudimentary, and if you want something exceptionally stable, then this is probably not for you. This Big Lots greenhouse features metal frame shelving and a plastic, roll up cover that provides protection, yet still lets a lot of light in. In ideal circumstances, I'm sure you could get quite a lot out of this greenhouse, however I would be very careful to not place it in a spot that's too windy, because then you might actually see it blown away! Seeing this greenhouse though, I definitely become filled with all kinds of possibilities. You could obviously start seedlings early, you could get a head start on the growin season for sure. And you could host some plants which normally wouldn't do very well in your climate such as chili peppers, citrus and other such plants. Indoor / Outdoor Conclusion: Great for starting out growing stuff without spending a whole lot of money. "12 metal frame shelves. Zippered, roll-up door for easy access. Provides plant protection, and enables year-round gardening. Cover included"